I live in Boulder, Colorado and ride year-round both for fun and fitness. Although it snows often, the roads are usually free of snow. I enjoy riding outdoors even when the temps are in the 20s. What do I wear? I start by consulting the thermometer outside my window and the weather forecast. I then select clothing based on the current conditions and then forecast high and hedge my bets in case the forecast is wrong. As a rule of thumb, if I'm warm enough when I throw my leg over the top tube then I'm overdressed, because I'll generate heat as I ride. I pay particular attention to the forecast for wind. 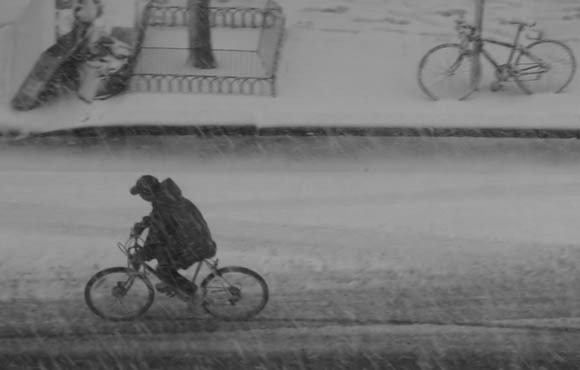 The breeze we generate while riding cools us in the summer, but chills us in the winter. Even with no wind, riding at 15 miles per hour at 40 degrees Fahrenheit, the effective temperature is 32 degrees. To determine the wind chill consult the National Weather Service's Wind Chill Index. Wind chill is one of the main causes of hypothermia, when your body loses heat faster than it can produce it and your core temperature starts to fall. Most cases of hypothermia occur when the temperature is around 40 degrees and it's unexpectedly rainy and windy. Hypothermia begins with shivering and as your core temperature continues to drop, your heart, nervous system and other organs don't work properly. If you lose fine motor control, for example you can't use your fingers to manipulate a zipper, or if you start to stagger, you are developing severe hypothermia and must get out of the cold. Dry, still air provides the insulation we need. Although we choose tight streamlined clothing in the summer, in the winter looser clothing is better because it traps air for insulation. 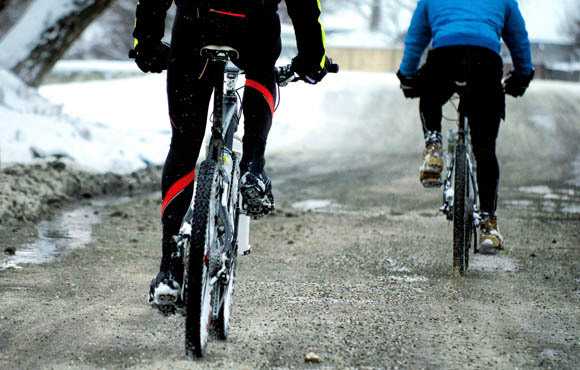 Wear multiple layers—each with a different purpose—to allow you to adjust your clothing as the ride (hopefully) warms up. On your torso, start with a wicking layer to wick the sweat away from your body so that you stay dry. Do not wear cotton, which will stay damp rather than wicking away the sweat. Then wear one or more loose insulating layers. If you expect conditions to warm up significantly, stuff a few layers of newspaper under your jersey as an additional wicking layer, which you can then throw away. 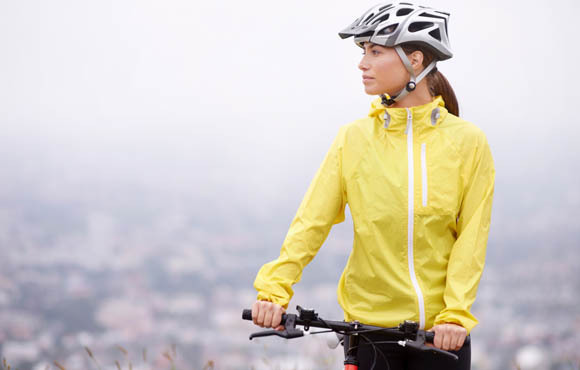 Cover your layers with a wind- or rain-proof outer layer. When I started mountaineering in the 1960s in Washington, the best gear was army surplus wool clothing. We wore it hiking in the rain and climbing the snow-covered volcanoes. I still wear wool for warmth because it retains its insulating quality even when wet from sweat or precipitation. 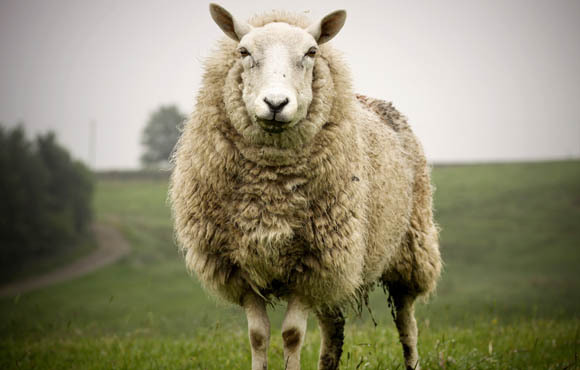 Wool is both a great wicking layer and an excellent insulating layer. - A two-way zipper or Velcro closure in the front to adjust the ventilation. Also, by opening from the bottom you can reach your jersey pockets. Zippers have a fabric baffle on the inside of the zipper—test that this is large enough that it won't get caught in the zipper. - Pit zips to allow you to increase or decrease the ventilation, which should be covered on the outside by the coat fabric. - A long tail to cover your buttocks. On some coats this flap can be folded up inside and secured with Velcro when it isn't raining. - Adjustable cuffs, which can be tightened with Velcro. Elastic cuffs can let in a lot of cold air. - A high protective collar to keep your neck warm and dry. - Reflective material across the back and front and down the sleeves. Your knees have very poor circulation and chill easily. As they get colder their lubricating fluid gets thicker and doesn't do as good a job of lubricating the joint. This increases the risk of injury. Around Boulder, I see the pros that are paid to ride wearing knee warmers even with temps in the 60s. 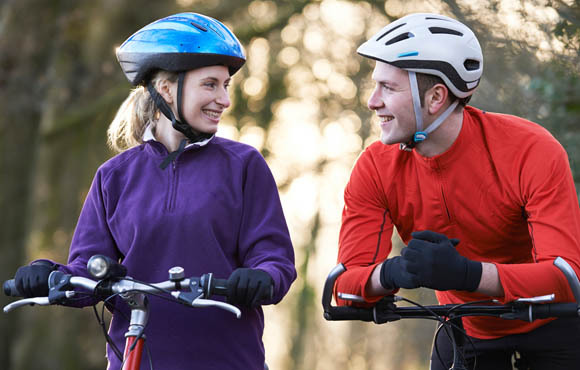 To protect your knees, wear knee warmers, knickers or tights when the temperature is below 65 degrees. Because your legs are working and generating heat they need less protection than your torso. 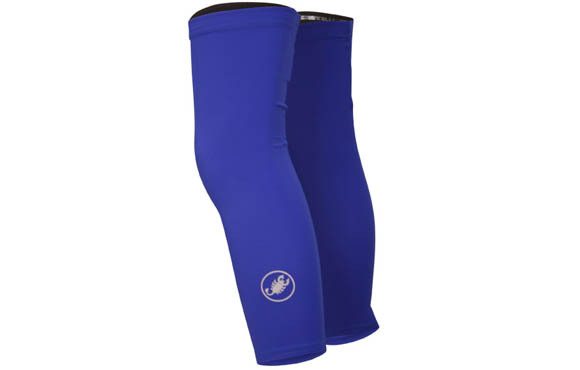 Depending on conditions you could wear knee warmers, tights, knee warmers under the tights or tights with a wind-proof front. Rain pants tend to get in the way. If your legs are getting wet, try mountaineering gaiters or spats, the English combination of a gaiter and bootie. Layering applies here too. On your head wear a windproof skullcap. If it's colder or rainy, add a helmet cover. Cyclists in very cold areas have winter helmets with the vents covered with reflective tape. In my seat bag I have a motel shower cap as an emergency helmet cover a thin polypro balaclava, which I can use as a wicking layer and if necessary pull down over my face. 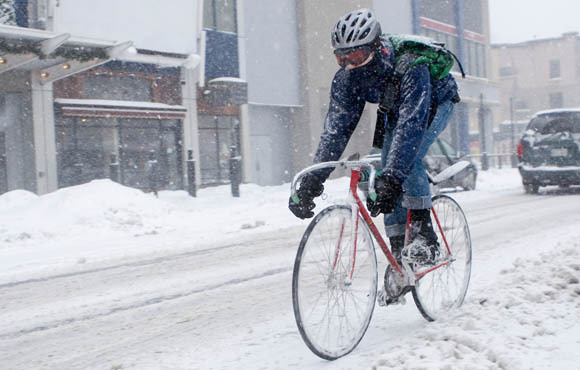 For your hands winter cycling gloves are a good start; however, they may not be warm enough. Get a pair of lobster shells, which have the index and second finger together and then the ring and little finger. These provide more protection and still allow you to manipulate your shifting and brakes. I carry polypro glove liners in my seat bag, which I can wear as a wicking layer under gloves and shells for added warmth. If I need to remove the outer layers to get food out and unwrap it, for example, the glove liners provide some insulation. You can also wear layers on your feet. Start with thicker socks. I like wool socks that come up my calves. Loosen your shoes so that you have good circulation in your feet. 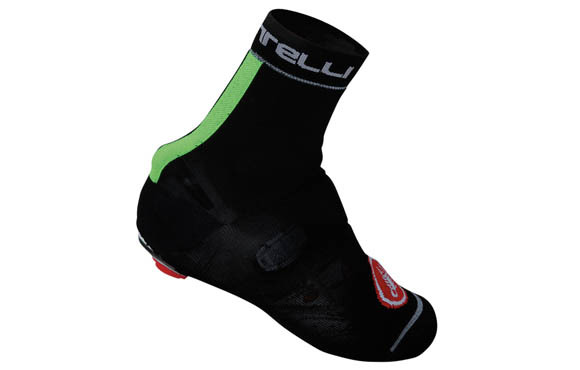 If your feet are still cold wear booties; however, get booties designed for winter riding, not tight racing booties. As a cheap alternative get a pair of large heavy wool socks, cut holes in them for your cleats and wear them over your shoes. Or in a pinch wear plastic bags over your socks, taped closed at the top. 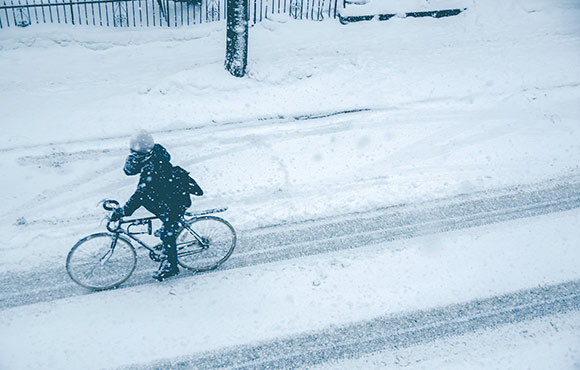 In the summer being a little too hot or too cold while riding is unpleasant; however, in the winter wearing too much or too little may have serious consequences. Always carry an extra layer for your torso as well as your head and hands. If you start to chill, stop and add protection. 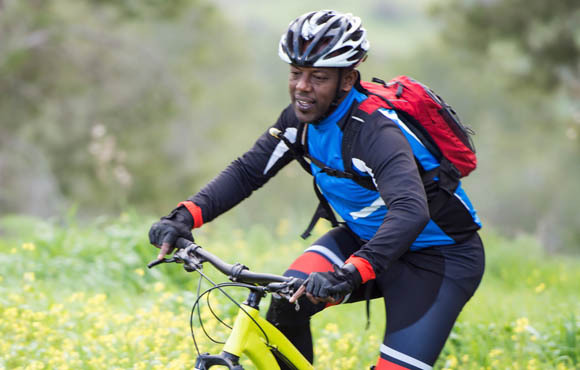 If you start to overheat, stop and adjust your layers so that you don't get sweaty. If you don't take the offseason literally and continue to ride, you'll have good baseline conditioning when you start training for your main cycling season. 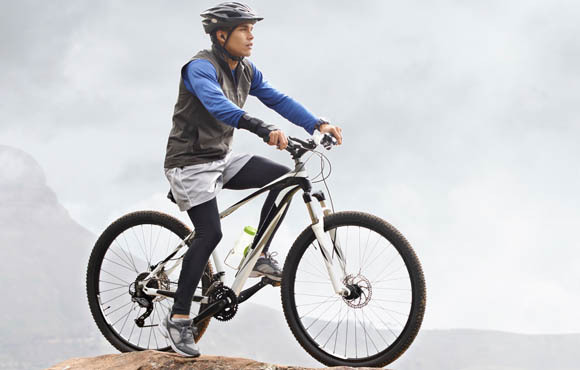 By riding outdoors you'll have more fun than grinding away on the trainer. 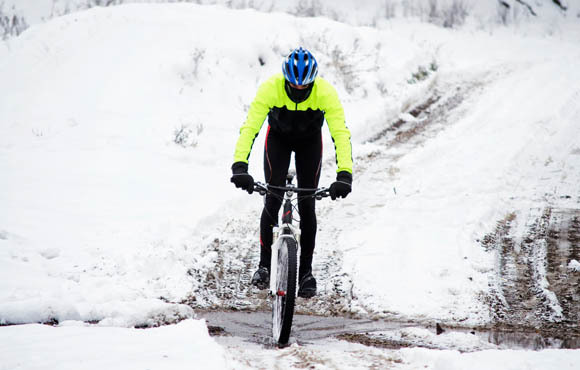 If you dress in layers, wear base layers that wick away perspiration and adjust your clothing as the conditions change, you can ride comfortably in most conditions. 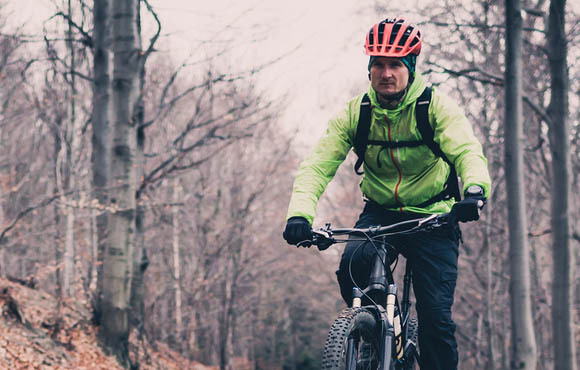 Follow these tips and, like me, you'll enjoy riding outdoors year-round.